It’s a set of extra light box letters! Postmen might be happy when there’s a lack of letters, but that’s not great for you when you’re trying to write a brilliant message on your A4 Cinema Light Box. 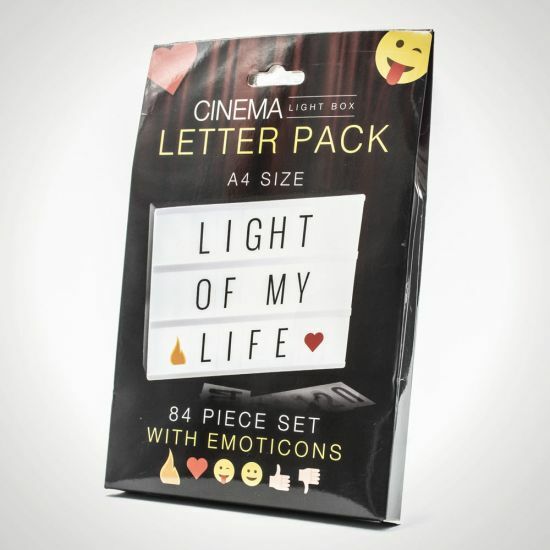 So, if you find yourself lost for words, you need this Cinema Light Box Letter Pack! Just like the pack that came with your light box, this extra letter set comes with 84 pieces, including letters, numbers, special characters, and even emojis! So, you’ll have double the letters for double the fun! Think about the world that your new letter set will open up for you… You’ll be able to write HAPPY BIRTHDAY POPPY instead of HAPPY BIRTHDAY OY, and you’ll be able to advertise a Zoolander and Zombieland double-header in the living room! So, don’t let a lack of letters keep you from saying what you really want to say… get your A4 Cinema Light Box extra letter set today!